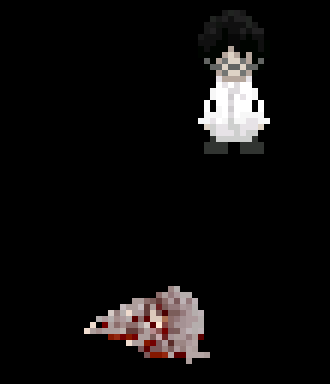 The Doctor and Nurse are minor NPCs that appear in one or two places within the game. The nurse appears in both the Hospital and within the Plant Corridors. To find both the Doctor and Nurse simply go to the Hospital and enter the door with the bloody arrow pointing at it. The Doctor will be idling in a chair and the Nurse will be simply walking holding a clipboard. To find the plant-covered Nurse travel to Illusionary Corridors, and into the passage to the Plant Corridors. In ver 0.9 only the Doctor was in the game and he was in an empty room as opposed to the cabinets and desk. Hitting the doctor will make him leave behind his glasses which will stay there where you hit him. If you leave the room and come back in they'll be sitting on the desk where he was originally sitting. If you kill the nurse, she won't respawn, however, the nurse covered in plants will. They could be the staff that treated or interacted with Sabitsuki when she was in the hospital.